For my skin type, I’m using the pink bottle Biore Marshmallow Whip Facial Wash, it is suitable for normal to combination skin. 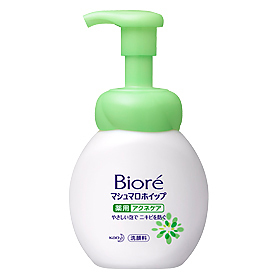 Biore Marshmallow Whip Facial Wash gives you instant foam with just 1 pump! With an improved formula, it has Skin Purifying Technology that rebalances & improves skin. Also contains hydrating ingredients that softens skin. With 800% more micro-bubbles and 8x denser foam, Biore Marshmallow Whip Facial Wash can penetrate into pores to remove all dirt, oil and impurities. The texture of the foam is very light and gentle to your skin. I love the scent of the foam, makes me feel refreshed after cleansing my face. I tried on my left hand with Biore Marshmallow Whip Facial Wash and my right hand on other facial wash.
My left hand is obviously fairer and radiant than my right hand using other brand of facial wash. Besides cater to normal to combination skin. There are 2 other types of Biore Marshmallow Facial Wash for Dry Skin and Acne Skin (New!). With an improved formula, it has Skin Purifying Technology that rebalances & improves skin. Also contains 40% Beauty Serum for extra moisturization. With 800% more micro-bubbles and 8x denser foam, Biore Marshmallow Whip Extra Moist Facial Wash can penetrate into pores to remove all dirt, oil and impurities. Suitable for dry skin. With an improved formula, it has Skin Purifying Technology that lightens marks. Also contains anti-bacterial ingredients that prevents acne. With 800% more micro-bubbles and 8x denser foam, Biore Marshmallow Whip Facial Wash can penetrate into pores to remove all dirt, oil and impurities. Biore Marshmallow Facial Wash also available in Refill Pack! Biore Marshmallow Facial Wash is available at all leading pharmacies and supermarkets. Visit and Like Biore FB Page https://www.facebook.com/KaoBiore for more information!